I quit smoking eight years ago today. After not smoking for eight years, I sincerely wish I could say it was 18, 28, or even 38 years ago that I quit but it's just 8. The headline news of the lung cancer/smoking connection was big news about the time I started smoking. The arrogance and immortality of youth made me just plain ignore that information. Like many other smokers, I made the statement "well, we all have to die of something". Which is true we all die of something but sadly you don't just die. There is a process of dying and quite frankly dying of lung cancer is not a pleasant process. I heard one person say it was like suffocating in your own lungs. Doesn't that sound like fun?? Regrets?? Oh yes I have many and one of the biggest is that I EVER put a cigarette in my mouth. How stupid was that? .....and Annie has to steal it back. Sorry Sam. Ice fishing can be a brutal reality. Ordinarily, I don't send you this stuff, but this is interesting, (For my brother, maybe for a holiday season blog). I don't know if you have heard of the "Flash mob" thing but it is a cell phone phenomenon where people text one another to be in certain place and time and spontaneously do bizarre things in a seemingly random fashion and cause a scene, then disappear leaving the crowd to scratch their heads. Many of the participants don't even know one another. Examples are on this youtube page. Anyway, the Hallelujah Chorus is a natural flash mob event, probably the best ever. A borderline mentally ill genius composer named Handel wrote this piece (called "The Messiah") in something like 17 days about 300 years ago. It is pure genious, one of the most creative and beautiful pieces ever written. It is the favorite of choirs and orchestras everywhere. It is a cult. Once you have done it as a musician, you forever have the right (and are encouraged to ) stand and join in in any performance you attend, when the Hallelujah Chorus comes. It is the final song in about a 2 hour extravaganza. Most groups never get good enough to do the whole thing, it is super difficult. I have done it twice, once with an orchestra, but only the easiest one third or so. Anyway, so you see, this flash mob is a spontaneous and mysterious event not entirely understood by it's audience and then suddenly the audience is invited to join in. There are three groups in the crowd. It is fun to watch and decide which group each person is in. The flash mobbers obviously know the music and are quite good. A second group has done it before and joins in, knowing or remembering their parts as by the cult tradition. The third group just gets swept along and sings "Hallelujah!". There may be a fourth group that just stands in wonder. It is wierd, but wonderful. It really catches the spirit of the season! Wonder of wonders…..we were invited to a holiday party by our co-worker and friend Cindy. Cindy is from Bloomer, WI and we trade WISCONSIN treats back and forth when one or the other of us goes home or has visitors that bring goodies. This is Cindy, her husband Ron, and Boo-boo. I think Susie is bigger than her dog. This is Cindy and No-No (Noelle) another co-worker. You wouldn’t know it by looking but No-No is busy mixing up mudslides…….she must have done a good job because they were yummy. This is the whole group….a small party but lots of fun!! .........afterward, we recounted the treasures we had bought including a wooden mallet, a staff, some spice sachets, a woven reed figurine, some wool yarn figure, and, of course, the door hook from the blacksmith. All in all an interesting holiday experience. My Grand daughter Mackenzie is 12 today!! Did you notice that I had THREE grand daughters with birthdays this week?? WOW!! My Grand daughter Marissa is 15 (what!! already??) today..
Have a very Happy Birthday!! 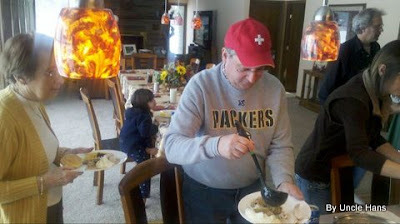 THANKS UNCLE HANS, FOR THE LAST FOUR BLOGS ABOUT THANKSGIVING SPOONER STYLE. 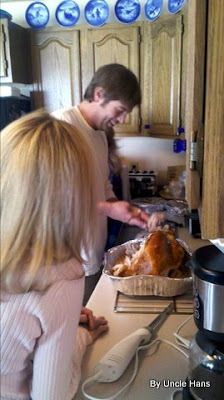 THEY MADE US A LITTLE HOME SICK AND WE SURE WISH WE COULD HAVE BEEN THERE FOR THE FESTIVITIES. SO WHEN ARE THE HAPPY CAMPERS COMING HOME? 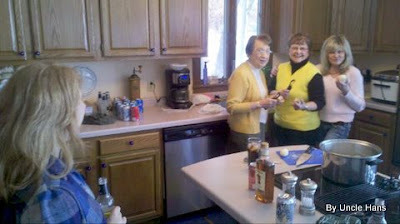 WELL, AS OF NOW, MARY PLANS TO BE HOME IN WISCONSIN FOR HER MOTHER’S 90TH BIRTHDAY IN MAY, AND WE BOTH HAVE TO RENEW OUR DRIVER’S LICENSES IN THE FALL OF 2011. BOTH TRIPS ARE A LONG WAY OFF AND SUBJECT TO CHANGE. LIFE IN LAUGHLIN CONTINUES AT OUR SLOW PACE, WITH SUNDAY FOOTBALL BEING OUR MAIN SOCIAL ACTIVITY. IT’S THE SAME COUPLE OF TABLES OF VIKING FANS AND A TABLE OF PACKER FANS. AFTER THE GAME, IT’S “SEE YA NEXT WEEK”. WORK IS SLOW, BUT HOPEFULLY WILL PICK UP AFTER THE HOLIDAYS AND THE REST OF THE SNOWBIRDS ARRIVE. 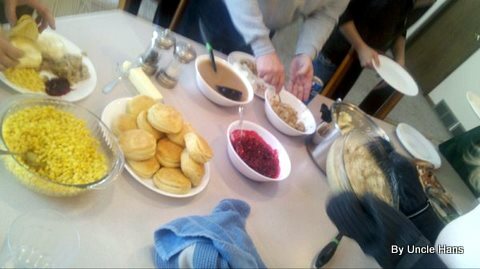 OUR COOKING PROJECTS HAVE BEEN CENTERED AROUND HOME MADE SOUPS, WITH CHICKEN NOODLE, SPLIT PEA, AND HAM AND BEAN BEING THE MOST RECENT. SUSIE-Q THE CAT KEEPS US ENTERTAINED AND DIRECT TV FILLS IN THE REST OF TIME. 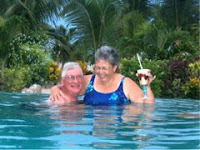 NOT A WHOLE LOT TO BLOG ABOUT UNLESS YOU WANT TO HEAR ABOUT OUR SUNNY AND WARM WEATHER. I originally was going to add WHICH birthday these are but DAMN those numbers are getting scary!! So I didn't. 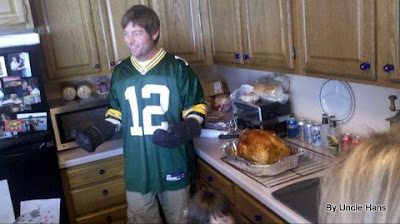 .........in typical fashion, Neil showed up after the work was done but before the chili and beer was served. Over the years, Rechsteiner family get-togethers have been bizarre and unpredictable. Our Dad contended that without some sort of fun group activity, the visit just degenerates into bitching about one another" So we actively plan for some sort of "fun group activity". Often they involve animals, surgery, chain saws, snowmobiles, motorcycles, meat processing, or some you-name-it combination. ...........here you see the exposed scrotum in a picture which my camera failed to completely record for some reason (duh, like common decency?). OK, in the name of common decency, I won't show you the two small incisions made, one in each side. I also won't show you Neil expressing or squeezing out the testicle and then ripping it out. I won't show you Renee jumping on the chance to tear the second one out, I won't show you the laughing gleeful faces of all the women in the room. ...............I am not above, however, showing the techs, the testicles, and the glee. ........most university hospitals have a "theatre" operating room where many people can observe the surgeon at work. ............which was very good. It meant that we could get back to bitching about one another! 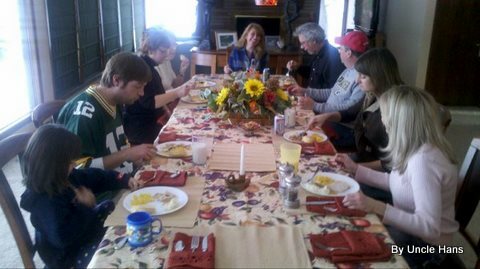 There is a long history in the Rechsteiner family of not celebrating a holiday on the actual day and Thanksgiving was no exception. This is Nov 28 as we missed by only a few days. Here is the KP section and Carol looks on. Actual, Carol was a driving force in bringing the whole meal together for halftime of the game, which is a very narrow window for a turkey. You have to stay tuned to the blog for the next few days.